Deep within each and every one of you fuckers is a primal beast itching for release. It’s that ancient urge to hunt, to kill, to survive. And it’s only a hair’s breadth away from grabbing the nearest blunt object and re-enacting some Neolithic memory. Thankfully, this offshoot of the noise/grind mongrels Clinging to the Trees of a Forest Fire is all set with the soundtrack for that very specific occasion. 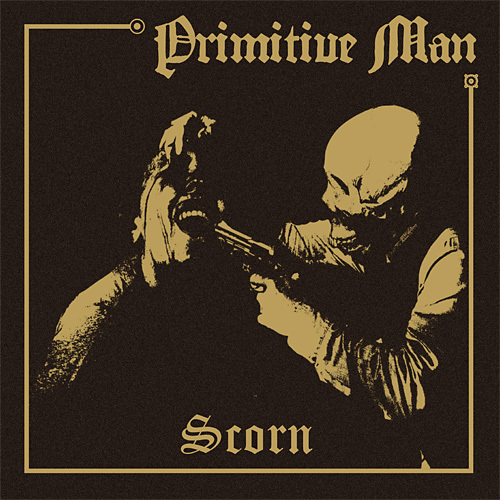 Primitive Man’s debut full-length, Scorn, is crushing, crawling, distorted, sludgy and echoes the very primitive nature found in us all. The title track starts things off with nearly twelve minutes of grating sludge that at times crawls as if from the very primordial swamps that spawned our ancestors with burly, monolithic guitars that drag across your spine slowly and deliberately. The drum work is barbaric at best as it matches the slow march and lead growler Ethan McCarthy. It’s a taxing song that may take some effort on your part to get through the first time around, but it’s entirely worth it. The reverb that ends the opening track fades in through burly bass lines to get “Rags” off to a full and beefy start. This song is certainly much more up tempo than the album opener, but it also slows to a glacial crawl as the vocals come. The song, like much of the album, is oppressively heavy and puts all its weight upon your cranium with distortion-drenched sludge and crust. Even in the sample-filled, ambient noise track “I Can’t Forget,” the weight of the music is immense. “Antietam” (the second longest song at over nine minutes) starts off with discordant guitars that slowly develop to a full wall of riffage as the guttural and tortured vocals arrive. The song continues along fairly slowly until about the two minute mark when we actually have a solid clip rolling along with actual riffs and churning bass (which sounds great on this debut by the way). This track eventually dissolves into a miasma of slow moving guitars, sporadic drums and rabid growls. “Black Smoke” is a three minute long reprise of droning noise that’s rather ambient and distant which could be skipped in subsequent listenings if you don’t require the mental break. “Stretched Thin” is a chugging beast of a song as if that primordial ooze has finally started to take shape and evolve a great deal in a short time span. Again, that excellent bass comes through the crushing din of distortion while the drums get along at a nice gallop and McCarthy’s growls seem to become that much more guttural and violent. Album closer, “Astral Sleep,” returns us full circle to the more slowly moving and colossal weight that “Scorn” first introduced us to over 35 minutes ago. The song is vicious and serves to wrap up one hell of a debut album quite well. 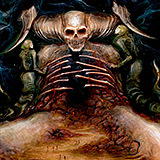 Scorn is not an easy album to get through, but then again, when is anything easy all that much fun. The weight of this release is massive and requires a solid commitment on your part, but in the end it’s completely worth wile. Primitive Man have certainly captured some deep-seated, pent up and primal fury within these seven songs.